A mother and son harvest greens at a farm in Homa Bay, Kenya. RTI International, October 2018. Vision screenings under a big top tent in Busia County, Kenya. Eye Rafiki, 2018. A portrait of Saida in Kakuma Refugee Camp in Northern Kenya. Separated from her parents during the ongoing war in Somalia when she was seven, Saida spent much of her childhood out of school, relying on casual jobs cleaning houses to survive. She returned to primary school as an adult and is graduating with a university degree in social work in a few months. She said she'll use her education to support other children of conflict. “I want to work for this community," she said. "They are like a family to me." October 2018. 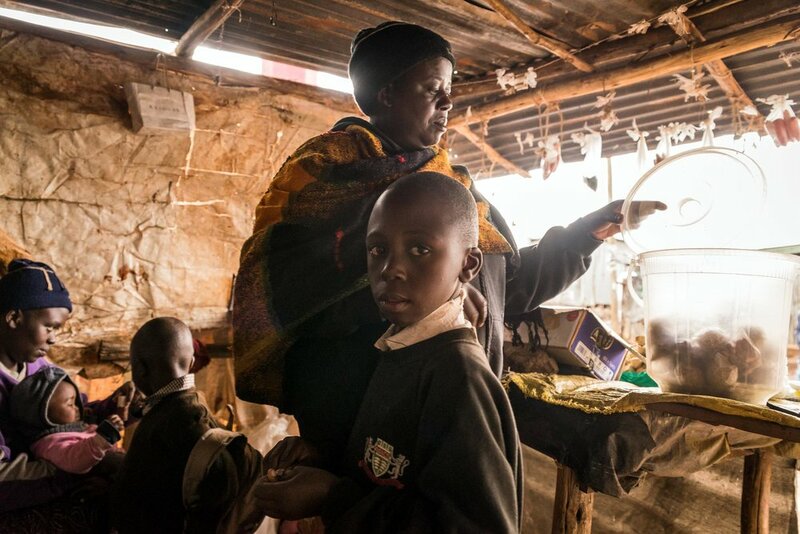 Chege Njoroge sits inside his new home, a dark, tin-roof shack in Kibera, an informal settlement in Nairobi, Kenya. Njoroge - along with 10,000 others – was displaced when municipal bulldozers demolished their homes to make way for a new road last July. Telegraph, 2019. Karen Andenyi and her son Mark watch as construction workers excavate a new road in Kibera, an informal settlement in Nairobi, Kenya. Andenyi said she isn't sure if her house will be spared from demolition. Telegraph, 2019. An artist uses a giant loom to weave a blanket at Kilombera Weaving in Jinja, Uganda. February, 2019. Surrounded by offerings, liquor bottles and illegal animal pelts, Shaman Bujagali speaks about his role as a religious leader and protector of the ancestral spirits residing on the Nile River in Jinja, Uganda. Several hydroelectric power dams have been built on the Nile River in Uganda in the last decade, displacing community members and angering the spirits who live in the Nile waters, he said. February, 2019. Fishermen bring in their evening catch from Lake Naivasha, Nakuru County, Kenya. October 2019. Afternoon feedings at the David Sheldrick Elephant Orphanage in Nairobi, Kenya. February 2019. Boys play on the corner of New York Street in Kakuma Refugee Camp in Northern Kenya. They are part of the 185,000 registered refugees and asylum-seekers in the camp. Most are from Somalia, South Sudan, Ethiopia and Uganda; all have fled war, conflict or targeted violence. Some have lived in the camp their entire lives. A boy with physical and learning disabilities is carried to his school bus at the Mary Rice Centre in Kibera, Kenya. October 2018. Pingu sets sail on a dhow in Lamu, Kenya. June 2018. Easter portrait of Louise in Diani, Kenya. April 2018. Maureen, a mother and HIV positive survivor, waits for her interview in Jinja, Uganda. Hospice Jinja, 2019. Dad and Greg on the 4th of July in Hudson, Wisconsin. July 2018. Musician Al Church performs his song "Savannah" for Cody Lee Brown's new music video in Minneapolis, Minnesota. August 2018. Savannah Smith on the set of for Cody Lee Brown's new music video "Savannah" with Al Church in Hudson, Wisconsin. July 2018. 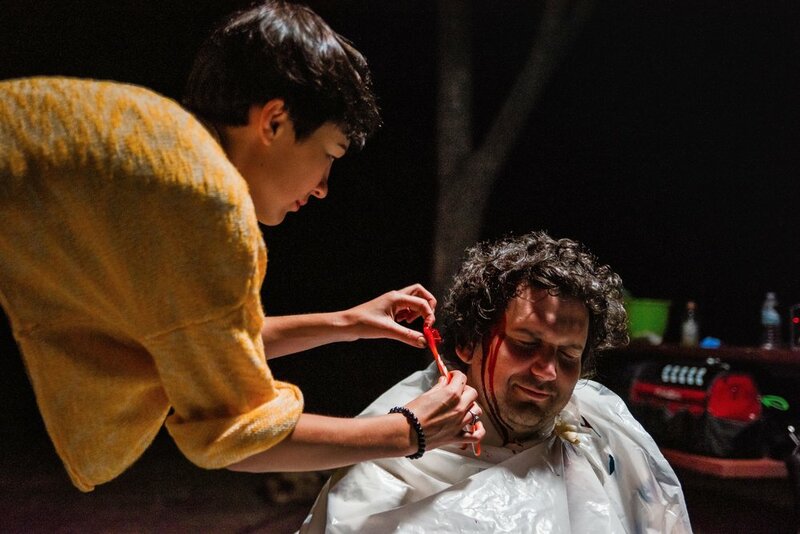 Musician Al Church prepares for a night scene on the set of Cody Lee Brown's new music video "Savannah" in Hudson, Wisconsin. July 2018. A man holds a campaign sign for presidential candidate Raila Odinga of the opposition party in the Kibera neighborhood of Nairobi, Kenya. Public Radio International, August 2017. “Uhuru must go!” yells a demonstrator in Kibera, an informal settlement in Nairobi, Kenya after the country's August 2017 elections. The man blamed current President Uhuru Kenyatta for the lack of jobs and widespread poverty in the area, and demanded that the President step down from office. Public Radio International, August 2017. Opposition party members chant campaign slogans in support of National Super Alliance Presidential candidate, Raila Odinga in Kibera, Nairobi. Public Radio International, August 2017. An election official wait for confirmation to begin counting votes for Kenya’s next president in Nairobi, Kenya. Public Radio International, August 2017. Supporters celebrate as incumbent Uhuru Kenyatta wins a second term as president of Kenya. August 2017. Caleb stands against a backdrop of posters supporting the National Resistance Movement political party in southern Uganda in January 2018. Deployed to northern Uganda when he was 19, the former solider said he “killed many people” while fighting in the Ugandan Bush War. “But now, I’m saved,” he said. “I’m born again.” Caleb now works as a carpenter in southern Uganda. From 1981 to 1986, Uganda was embroiled in a civil war that pinned President Apollo Milton Obote against rebel fighters led by current President Yoweri Museveni. Obote was ultimately overthrown by Museveni’s National Resistance Army and replaced by Tito Okello. Between 100,000 to 500,000 people died in Uganda as a result of the Ugandan Bush War. Both sides were responsible for widespread human rights abuse across the county. A woman carries a package across Shella beach during Ramadan in Lamu, Kenya. June 2018. Beatrice, a small scale trader, sells produce with her family at her roadside stall in Kawangware, an informal settlement in Nairobi, Kenya. Beatrice struggled to earn enough money to feed her children and send them to school but thanks to the grassroots initiative, which works in tandem with Oxfam GB to support low-income women working in informal sector, she is now able to afford rent, food and school fees for her children. “Back then life was very difficult,” Beatrice said. “I often didn’t have any source of income, I depended on others and begging for help. But today I help myself.” Oxfam, 2017. A Bridge Academy teacher reads from her tablet as students recite a classroom exercise at the Kingston location in Nairobi, Kenya. Quartz, 2018. A hospice patient and her daughter discuss end-of-life care with nurses in Jinja, Uganda. November 2017. A boy holds a bouquet of flowers in Bangkok, Thailand. April 2016. A tuk tuk driver navigates the streets Phnom Penh, Cambodia. Wiyol, a short distance runner, collapses after morning training in Ngong Hills, Kenya. Originally from South Sudan, Wiyol now runs with Team Refugee, a group of athletes from South Sudan, Ethiopia and Somalia who train in the high altitudes of Ngong Hills to prepare for international competitions like the Olympics. "My dream is that I make it. I will be patient, I will work hard," said Gai Yang Top, a runner with Team Refugee. The team, which consists of refugees from South Sudan, Ethiopia and Somalia, train six days a week in the high altitude of Ngong Hills to prepare for international competitions like the Olympics. Boat driver Kenga has a spa experience on a small island near Watatmu, Kenya. Headshot for journalist Kristoffer Tigue. A young girl searches for shells in Jambiani, Zanzibar. 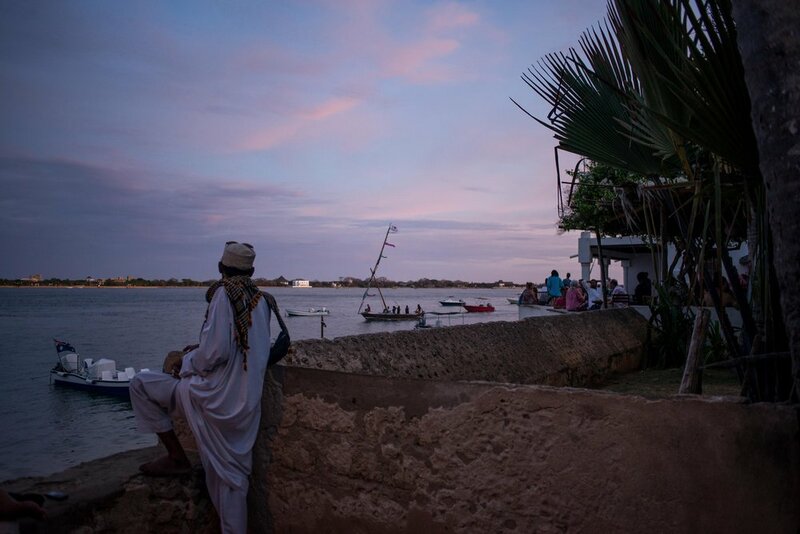 A man watches the sunset in Lamu, Kenya. March 2018. 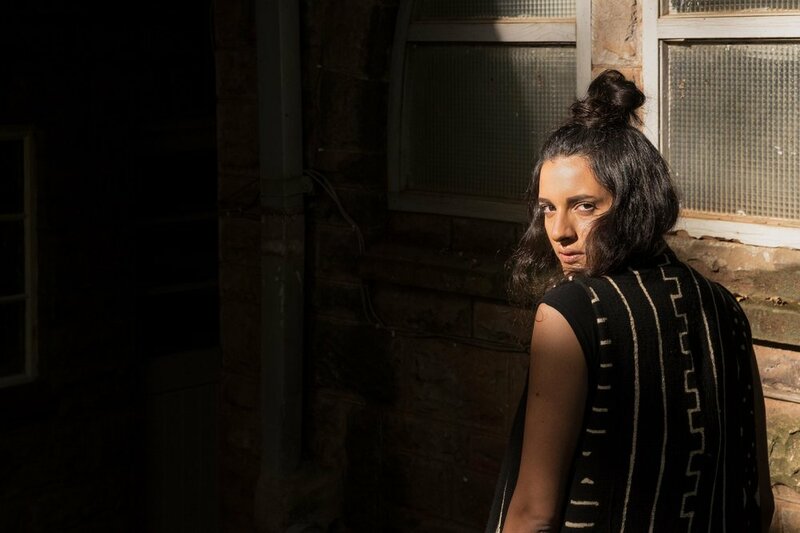 Fashion shoot for Lillibare in Nairobi, Kenya. Musa Gali wipes his face, which is partially covered with a large, cancerous tumor, during our final interview in November 2017. The 46-year-old farmer and father of seven was diagnosed with ocular cancer, a potentially treatable condition in Uganda, at least, until the country’s only radiotherapy machine broke down in April 2016. There was no hope of saving him after. Beach cleaner Bob Shaban with a handful of freshwater snails pulled from the banks of Lake Victoria in Uganda. These small snails often harbor the parasitic flatworm that transmits schistosomiasis. RTI, 2017. Wedding portrait in Diani, Kenya. Wedding guests are transported to a costume party in Diani, Kenya. A portrait of Susan Wairimu, a 50-year-old baker in Kawangware, an informal settlement in Nairobi, Kenya. Oxfam, 2017. Families wait for emergency food relief at a distribution site in Baringo County, Kenya. Kenya is one of several East African countries experiencing a severe drought leading to widespread food insecurity throughout the region.